As teachers, we sometimes have to remind ourselves that much learning happens outside the classroom. Because of this, I count myself very lucky to have the opportunity to garden with students at LCA. Through my years here, I have worked with students at both campuses to grow food in raised bed gardens. The benefits of this experience to children are many. At the most superficial level, it is an excuse to get kids outside and interacting with the natural world. The act of digging in the dirt is not a given for children in our world today, and I think there is immense value in that closeness to the earth. Studies have shown that a close connection with nature in childhood does more to promote conservation ethics as an adult than classroom instruction about conservation. Having first-hand experience with the wonder of nature is the most important factor in wanting to protect that nature. Many important science lessons can be learned at an intuitive level through trying to make things grow. Students learn about the cycles of nature and the timing of plants’ growth in relation to the seasons. Students experience first hand the life cycles of plants and what “ingredients” are necessary for a good harvest. They have to apply ideas like competition for resources as they avoid overcrowding. Students have also been confronted with the fact that not all insects are helpful as we pull pests off our food AND that not all insects are bad as we encourage spiders and pollinators. 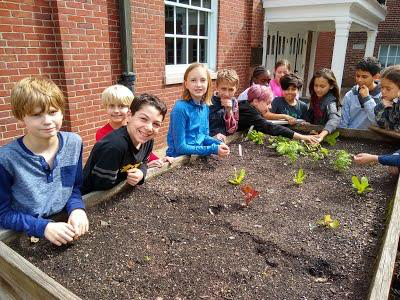 Students also learn a variety of important lessons specifically when growing food to eat. Many people in our country are completely divorced from the source of their food. Ask many U. S. students what they know about where food comes from, and you are likely to get an argument about Kroger vs. Whole Foods vs. Trader Joe’s. (I actually witnessed this argument in one of my classes this year!) The chance to see where food originates, as well as the work that goes into producing it, is invaluable in making people value good food. Studies have also shown that having students grow their own food encourages them to make healthier food choices. Through the years of working with students in LCA’s garden, I have seen many students willing to try something just because they grew it. I have heard students say things like, “I don’t like tomatoes, but maybe I will try one of these,” and “I have never eaten a radish before, but I will give it a try.” I have seen rooms full of students joyfully enjoying fresh salads. I have had parents tell me that their student had never willingly eaten a salad before, and be amazed that that same student came back for seconds of our homegrown salad! To me, gardening with students is nothing short of magical. I get such joy out of watching students enjoy the opportunity to get dirty and use a hose, and seeing the pleasure and amazement they get from watching food “appear” after all their work. It does my heart good to watch them eat local, organic produce and get pleasure out of the pure taste of good food. I hope I never have to give up this aspect of my work at LCA.